Bring Your Kid to Work Day — also known as the day of the year when you can finally put an end to those weird, vague descriptions your kids give when they’re asked what Mom and Dad do all day. It’s also a chance to liven up your office with new, excited faces. Here are a few ideas to keep everyone busy! Logo Coloring - Make coloring sheets out of your company logo and let younger children color it in. Take a Tour - For younger children with short attention spans, walking around the office and talking to different employees about their jobs can keep them engaged. If I Were CEO - Give each child a poster board to write or draw ideas about two to three rules they would make if they ran a company. They can then present their ideas — funny or serious — about how they would run a company. Yummy or Yucky? - If you work for a company that sells food products, have a taste-testing focus group and let the kids try different flavors or variations on your product. You can even let them brainstorm new flavors for the company to try! My Resume - Have each child make a list of her talents and skills, along with favorite subjects at school. Enter their answers into a resume template so that each child goes home with her own resume. Build It - If you’re in the construction or engineering industry, purchase a LEGO building set and let children build with their parents while talking about their jobs and role in the building process. My Mom/Dad - At the end of the day, have each child give a presentation on what they’ve learned about their parents’ profession throughout the day. Your employees are sure to laugh at some of their perceptions. Salesperson for the Day - If your company has a sales department, have each child create a sales pitch and try it out on an unsuspecting customer. You never know — the cuteness might sell! Coffee Delivery - Have the children pass out (sealed) coffee to each employee. Afterward, they can drink hot chocolate from company mugs and pretend they’re just like mom or dad! Scavenger Hunt - After they’ve taken the office tour, ask kids if they can go back and find certain items throughout the office. You can even include your employees as some of these items. For example, you could say, “Go find the person who manages the money,” and have the kids find the CFO. Job Fair - For teens who might be looking for a job direction within the next few years, have your employees give short (three to four minutes each) presentations about their jobs and responsibilities to show how the company works together. Coffee, Stat - If some of your children are old enough to drive, send them out on a coffee run. Your employees get some java and they get to go on a fun adventure! Service Project - If your company values service, put your kids and employees to work by volunteering together. Whether packing lunches for the needy or backpacks of school supplies for low-income schools, you’ll keep busy and serve together. Genius Tip: Try these 50 community service ideas. Crisis Mode - Break your employees and students up into teams and have them solve a series of false company crises together, competing with each other for the best solution! With any luck, you’ll be surprised at the creativity of both the students and your employees. A Day in the Life - At the beginning of the day, have students and employees spend time separately creating presentations about their typical day. Students can inform employees about the latest teen trends and employees can tell them secret company info — like where the good coffee is in the break room. 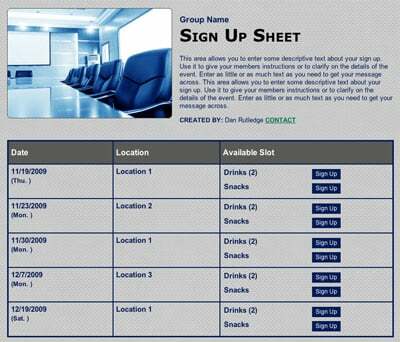 Create an Ad - Have students brainstorm and present an advertising campaign for your company. You never know what fresh eyes will come up with! Are You Smarter than A ___? - Create a Jeopardy game with age-appropriate school and work trivia and divide into two teams to see which side can win. Students and employees will have to team up to make sure their team has all the answers! Focus Group - Show the teens your company’s product and ask them what they like or dislike about it. If it’s online, see if they can figure out how to use it. Social Media Takeover - Let the students create some posts for your company social media for the day to give your followers an inside look about what it’s like to work for your company. It will give them something creative to do, and they might come up with awesome results. Research It - If you have upcoming ideas for projects, have your teen employees-for-the-day research options and put together information for your team. Employee for the Day - Send your employees home with invitations to give their children that ask them to come work for your company for a day. This is a great way to get kids excited about the day while making sure your employees don’t forget! Age Limit - After you decide on the day’s activities, set an age limit on child guests for your employees so that you ensure the day is age-appropriate. Plan B - Have alternate activities — such as picture books to read — nearby and available for kids who are shy or overstimulated to take a break with throughout the day. Bonus points if the books relate to your profession. Sit and Stand - Make sure to alternate activities that require sitting and listening with more upbeat and active games so that children don’t get bored or burnt out. Side by Side - Have each child recreate a picture of his or her parent at work (maybe even wearing their glasses)! Take to social media to show the two pictures side by side. Involve Everyone - Make sure employees without children are able to get involved or have the option to take the day off. You don’t want them to feel left out. Include Place Finders - Put nameplates on each employee’s desk or door, as well as signs around the office, so younger kids can easily find their way around and get back to mom or dad if they get lost. Give Superlatives - At the end of the day, give each child a superlative (Most Likely to be a CEO, Fastest Typer, Best Question, etc.) to take home and show his/her family. Feed Everyone - Bring in a catered meal. Everyone — young and old — gets excited about free food! You can provide lunch, along with snacks throughout the day. 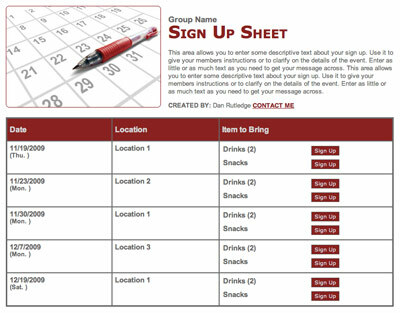 Assign Leaders - Have parents sign up beforehand to lead different activities so one person doesn’t have to do it all. Genius Tip: Coordinate volunteers with a sign up so the day goes smoothly. With these tips and ideas, kids are sure to want to come back to work the next day! 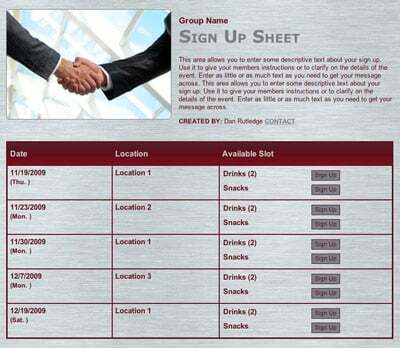 Plan a family friendly company picnic with a sign up!